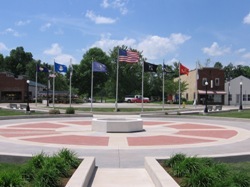 Freedom Park is dedicated to those who served in the Armed Forces of the United States of American in war and peace. 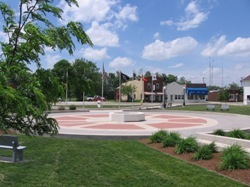 The Foundation led the effort to build the park, using grant funds and gifts from Ann H. Goodrich, the Bank of Geneva, the City of Portland, and hundreds of citizens who purchased brick pavers bearing the names of local veterans.The park is located at 229 South Meridian Street in Portland. The park currently contains 1,386 bricks. Brick pavers can be purchased for $100 by visiting the Foundation office at 107 S. Meridian St. or calling 260-726-4260. Each 4-inch by 8-inch brick paver will bear the name, rank, branch of service, and years of service or conflict in which the individual fought. While the veteran does not have to be a current resident of Jay County, we would like all veterans being honored to have some tie to Jay County. Two installations are planned each year - early May in preparation for Memorial Day and October in preparation for Veteran's Day.